The following post is a synopsis taken from the recent report on PLF Cinema from IHS Technology, published in June 2015. Premium large format (PLF) is one of the fastest growing and most active areas of cinema exhibition with significant potential to grow in size over the next ten years. The business for PLF cinema is also becoming increasingly competitive amid a growing array of brands and technologies. The digital premium large format (PLF) cinema market reached a total of 1,623 screens worldwide at the end of 2014, an increase of 15.8% from 1,401 in the first half of 2014. 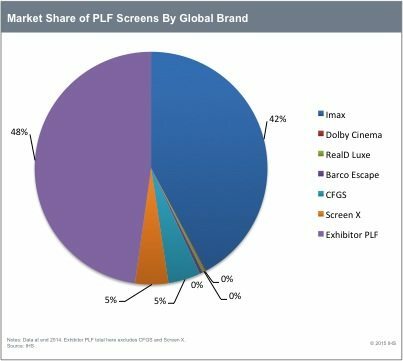 This total includes both the increasing array of exhibitor developed and branded PLF screens plus a now growing proliferation of global technology brands, led by the long-established PLF brand, IMAX, with over 680 digital screens at year end. Exhibitor PLF brands was one of the fastest growing segments rising 22.3% to finish 2014 at 926 screens. The largest net gain can be traced back to Asia Pacific (mostly China) and Western Europe. In Western Europe, exhibitor PLF screens more than doubled driven by new screen openings in the major Euro territories such as Germany, Ireland, Italy and the United Kingdom. Kinepolis confirmed its reputation as an innovator launching Laser Ultra, the first exclusively laser-based PLF brand by a circuit, combining laser projection from Barco and Dolby Atmos immersive sound. The UK was one of the fastest growing markets with PLF screens doubling over the six month period. As well, the UK was one of only three markets (alongside Australia and North America) where all top five circuits have their own PLF offering led by Vue Entertainment with 12 VueXtreme screens. North America, the largest market for exhibitor PLF screens, finished 2014 with 408 screens. Although growth has steadied, activity is still dominated by the major circuits including Regal Entertainment’s RPX brand and Cinemark’s XD screens. China remains the second largest market for PLF screens globally with 124 screens derived from three PLF brands: China Film Giant Screen, Polymax and Wanda X Land. The market here is growing rapidly up from 82 screens during the first half of 2014. CFGS is notable as it acts as a local Chinese PLF brand with installations across multiple circuits. There are now a total of 81 individual circuits worldwide operating a PLF brand up from 72 just six months prior. Although successful PLF includes a mix of marketing, service and technology, technology is a key battleground in this space with both IMAX and Dolby Cinema launching PLF screens with laser technology (developed in conjunction with Barco and Christie respectively). They compete alongside umbrella PLF brand RealD Luxe (active in Eastern Europe, Hong Kong and China) plus novel panoramic format, Barco Escape (20 screens to date) in the wider global technology PLF brand segment. The prospective internationalisation of CJ CGV’s ScreenX technology (three screen set up) and China Film Group’s GFGS brand further add to this crowded arena. A major 100 screen (over ten years) co-branded deal between Dolby and AMC Entertainment highlights the significant growth potential of this segment and PLF in general. Ultimately, the wider opportunity for PLF ties into the trend of growing segmentation of the theatrical experience through providing multiple and mostly premium options to audiences for how they want to engage with a particular film. PLF is now a core focus for exhibitors who are looking to strategically invest in the next generation of cinema exhibition with a view to retaining audiences and remaining relevant amid parallel improvements in the home entertainment sector such as 4K Ultra HD and high dynamic range (HDR). Charlotte Jones, Principal Analyst, Film and Cinema, IHS. For further information charlotte.jones@ihs.com.